For, Bugaboo has updated their Bugaboo Cameleon3 to include the faux leather handle bar and faux leather carry handle of the bassinet to add a more luxurious feel to the most iconic Bugaboo stroller. 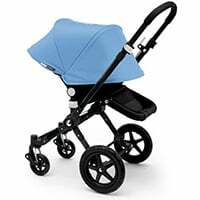 What's new for the Bugaboo Cameleon3? The 3rd generation of the iconic all-in-one stroller is even more versatile, stylish and functional than ever before. Light and compact, it’s also easy to lift and store. Suitable for a newborn or toddler, the multi-terrain Bugaboo Cameleon3 can seamlessly adapt to your journey – whether that’s through the city, woods, sand or snow. In fact, it can take you everywhere you want to go. The premium materials and endless accessory combinations will ensure your child stays comfortable in all weather conditions: spring showers, hot summer days, breezy fall afternoons and cold wintry mornings. The original and best just got even better. The Bugaboo Cameleon3 is incredibly light and compact for such a versatile and fully loaded stroller. Without compromising to key functionality, you’ll experience an easy ride and carry the stroller with great ease. Due to the stroller’s modular setup, it is even lighter and more compact when folded into two pieces. 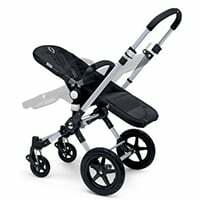 3 positions for all terrains, in the city, small swivel wheels in front will help navigate through tight spaces with one hand and adjustable suspension keeps you rolling smoothly. On rougher terrain, with big wheels forward, you’ll be ready for bumps that come your way. Easily converts into two-wheel position to pull through sand or snow.